It’s 1984. I’m in the toy aisle at Target with my young son. It’s a special occasion and I tell him to pick out anything he wants as long as it’s less than five dollars. It is 3:30 and I still need to make dinner. Even at five years old, Neil is not one to be rushed. Carefully, he peruses the long cluttered shelves, covering the entire toy department to make sure he has examined all possibilities. It’s 4:00 and I stare longingly at the check out line. Finally my son goes to the action figure aisle and decides on a panther that flies, becomes a jet, and best of all, shoots missiles from it’s mouth. Grinning from ear to ear he hands it to me. Crestfallen, he tries again. And again. He is agitated and I’m frustrated. Finally I grab a game and show it to him. ”I guess that’s okay, Mommy. Thank you”, he says, rubbing his eyes. I reread the price tag. 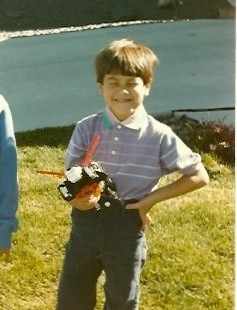 Somewhere between the baby dolls and the dump trucks I had turned into my father. Appalled, I put the game back, find the original black panther and add some bubble gum for penance, my son smiling at his good fortune. I drive home thinking that I concentrate so hard on avoiding my parents’ mistakes while trying to uphold the things they did right that I mix them up along the way and make a mess of it. Sometimes the only lesson we can take from situations like this is that when something looks like a flying panther that becomes a jet and shoots missiles from it’s mouth… it really isn’t.